Along the A20 highway at Maassluis a new innovative international head office, R&D centre and production hall for the Lely group has been implemented. Lely is a Dutch family business that offers robotic products and services to the agricultural sector. The new building, designed by Consort Architects, is expected to be completed by mid-2013. The project includes a warehouse with parking space on the roof and three connecting office buildings with showrooms, conference rooms and a company restaurant. The project illustrates the power of integrated design in a special way. From the crawl space up to the parking deck, at every level of the building it is evident that the various disciplines in the design and construction team have worked together closely for the best, most durable and fastest results. Lely has high sustainability ambitions for this project, ranging from the integration of the total complex into the existing area to putting up bat- and bird-nest housings on the factory hall. The far-reaching commitment to sustainability was awarded by the DGBC with the highest BREEAM certificate (‘Outstanding’, the maximum 5 stars) for the design of the production hall. This level has not previously been achieved on the European mainland by a building with an industrial function. The Office buildings achieved the designation ‘Excellent’ (4 stars). The warehouse (22,500 m2) was designed as a “platform building”, eliminating the need for expensive lowered loading docks with a pile supported concrete floor. The elevated business floor, consisting of hollow core slabs, was completely prefabricated, just like the rest of the building. This enabled a very high construction rate which can be phased “horizontally”. While on one side the pilecaps were still being placed, the roof sheets were already being mounted on the other side of the building. The prefabricated pilecaps were carefully engineered with simple connections of the cap to the foundation piles, foundation beams, hollow core slabs and columns. The pilecap dimensions of 2.4 m by 2.4 m were not just determined by the structural considerations, they are also a multiple of the width of the connecting hollow core slabs. This design has led to a quick assembly process. The grid distances of the concrete columns in the industrial building were tailored to the wishes of the client. 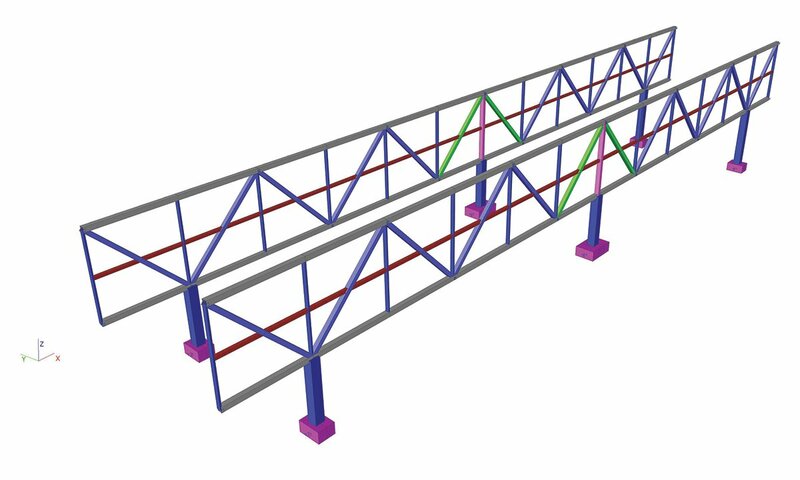 After an extensive study of roof variants, a structure with TT-slabs spanning 20 m was chosen. With a shorter span (10.8 m) of the prestressed roofbeams the number of columns on the production floor was sufficiently minimised. The columns are sandwiched into the prefabricated pilecaps at the bottom. Each column plays a part in the stability of the hall; there is no bracing. The office building adjacent to the warehouse is made up of a steel main supporting structure with hollow core slabs in between. The steel trusses are raised above ground level so that the freight cars can pass under the building. The diagonals, columns and connections in the trusses were designed with close consultation between the architect and the structural engineer. The trusses, along with the steel staircases, provide the stability of the buildings. A saving of the total amount of material used was obtained through the use of trusses as the main supporting structure. Scia Engineer software was used for the main calculations of the structure. With Scia Engineer it is possible to create fantastic 3D models. 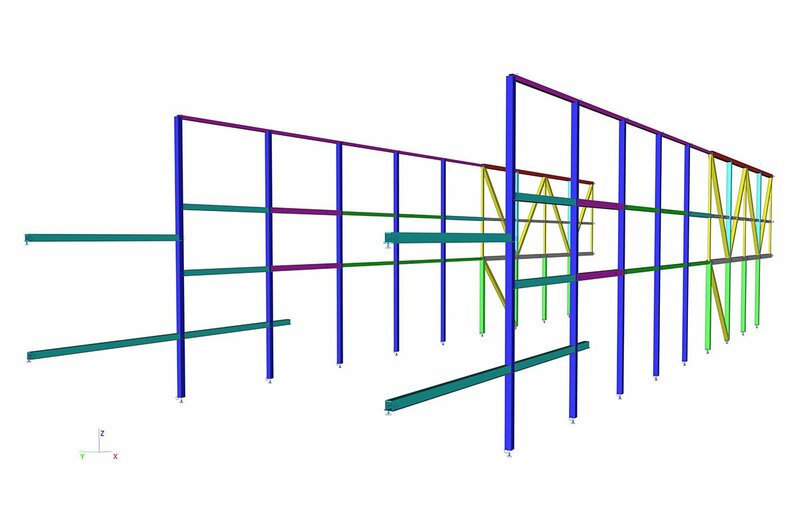 However, we have chosen to make the calculations of this project in such a way that the full structure could be represented with simple 2D models of the structural components. 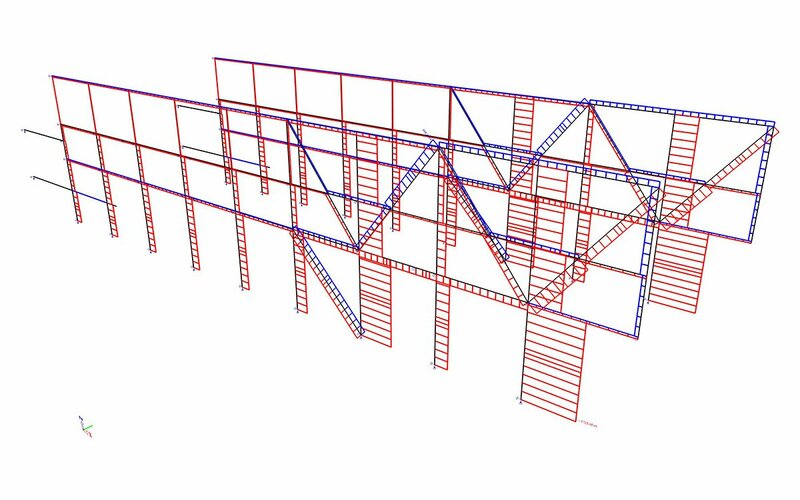 The power of Scia Engineer is that it is possible to calculate the entire building with a few 2D models of the trusses and beams. With this, we were able to present the structure in a clear and concise manner in the calculations.